As far as I’m aware, this is the first Sonic game that’s come out on PC since Sonic Heroes. 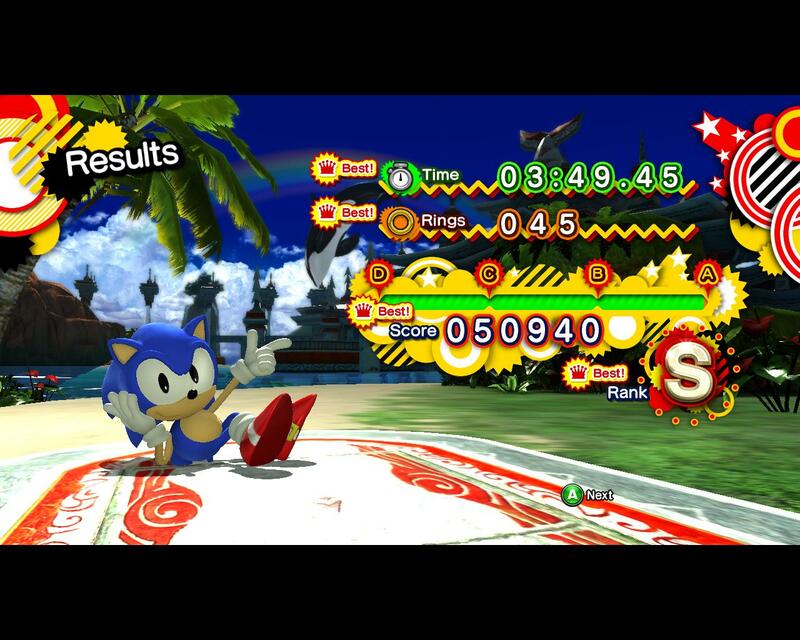 Which means I miss about a third of the references in Sonic Generations. Minor spoilers may be hinted at but there’s not really much to spoil. Except, perhaps, the assertion that it’s actually quite good. Plot is not something one should really go into when discussing a Sonic game, and, well, this one’s no different. However, it does use its plot to poke tremendous fun at Sonic throughout his 20-year history. The intro shows Tails presenting Sonic with a chilli dog (now there’s a blast from the past) as his birthday present. Old Robotnik shouts “who are these people?” when all the post-Knuckles characters step forward. What little exposition the game does perform is suffused with these little giggles. Unfortunately, there isn’t much of a main plot in terms of actual level content. The game is artificially extended with bonus challenges (of which you must complete at least a few to proceed). While some are fun diversions with amusing objectives (like end-post-keepy-ups to juggle the turnstile to the end of the level, in itself a beautifully self-referential puzzle only blighted by the turnstile not obeying the laws of physics), a lot boil down to completing the same level again in under a given time limit. "Robotnik? Nobody calls me that anymore!" 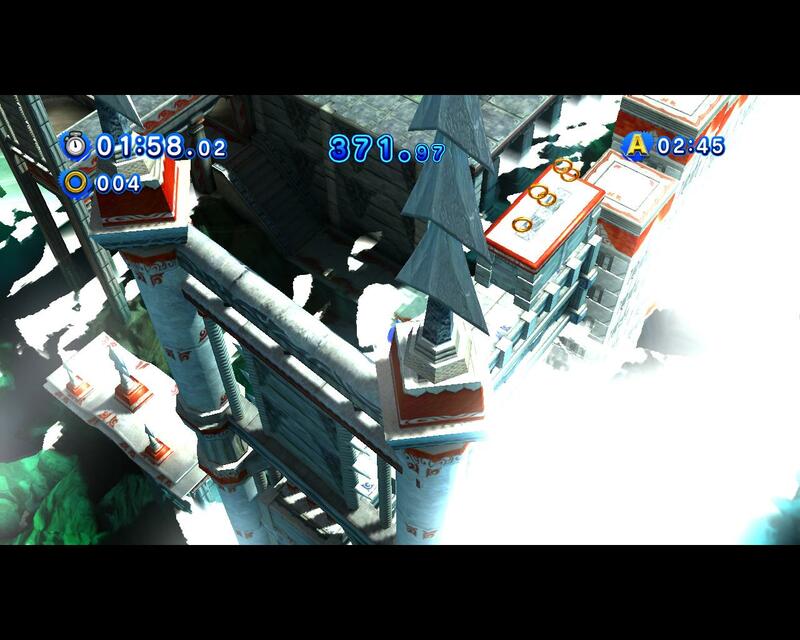 The bizarre thing is that the main recycled level designs from other games… aren’t. The level layouts are all new, Sky Sanctuary has a distinct new (but still pleasing) flavour with masses of new architectural elements, the side-scrolling version of Seaside Hill works in some gimmicks from Hydrocity Zone, while Sonic 2’s end boss has been almost completely rebuilt and really shares only its look with the original. And, well, that’s good. If I want to play the originals, I have the Sonic Mega Collection Plus right here. And while Generations might be a very fair punt over-all, it’s not exactly into S3&K-displacement territory. The classic Sonic levels demonstrate that not only does the original paradigm still hold water, but it is also completely compatible with the breathtakingly ridiculous direction the series has taken ever since Sonic Adventure. But hey, Duke Nukem: Manhattan Project demonstrated that years ago; why has it taken Sega this long to catch up? All the set-pieces from Sonic Adventure‘s representative Speed Highway have found a home, for example — the rockets and police helicopter transporting you neatly to new parts of the level, the huge construction-scoop boosters throwing you along sideways instead of forward. I’m slightly disappointed in the backing out of shields, though. Rather than being boxes scattered around at opportune moments, the different shields have to be bought at the skill shop using points you get for doing things. Also missing is the mid-air spin-shield from Sonic 3 & Knuckles that gives you a split-second wider attack and protection. But of course I’d miss that — it’s a get-out-of-mistake-free card. As noted above, the most modern Sonic game I’ve ever played is Sonic Heroes, which came out (on the PC) in the hazy depths of 2004. Modern Sonic, while clearly derived from Heroes (spring-boards and dash-rings still mostly come in triplets even though there’s only one of you), has moved the game on. I think the fatal flaw with modern Sonic is that he’s still not remembered how to actually be a game. All through Adventure and Heroes there come points when you just have to hold forward and trust that the game knows what it’s doing. 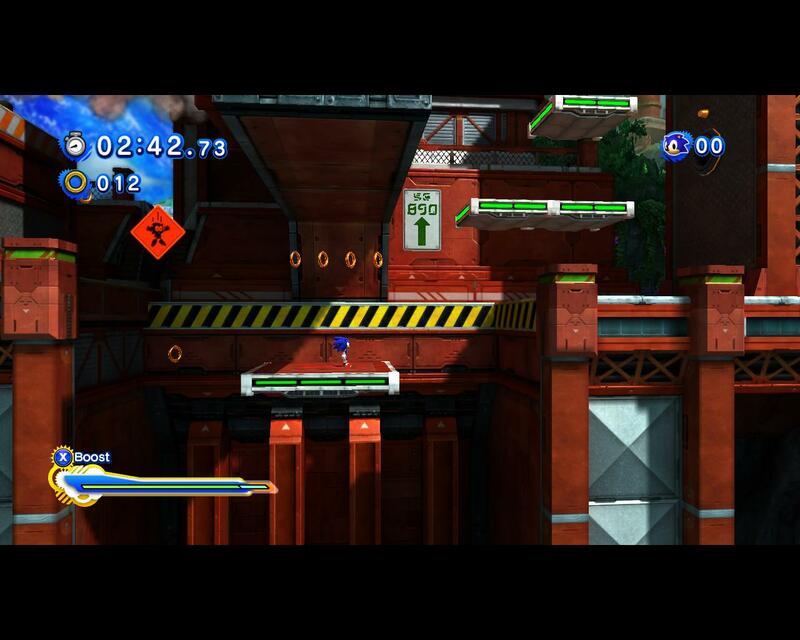 Modern Sonic in Generations is still mostly like this, with a splash of traditional side-scrolling platforming sections. Though the game might appear to give you freedom, it’s almost an infinite run of quick-time events. Sometimes modern Sonic forgets he is modern and turns into a side-scroller anyway. To its credit, though, modern mode is actually playable with keyboard controls — unlike Sonic Adventure and Sonic Heroes which are completely unplayable without a controller. I would have been using my old XFX thing for the modern stages, but the game decided not to recognise it, so I had to go with the keyboard and it wasn’t so bad in the end. Don’t try re-mapping the keys, mind you, because the config utility is totally gubbed. Modern Sonic also suffers from bloom, though it is only occasional. The homing attack has always annoyed me, because it turns some kind of movement control (skill?) into just mashing buttons. Sometimes, the game will give you no choice of target and take all control away from you. But other times, it’ll expect you to move a thumbstick in the vague general direction of where you want to go, or else it’ll throw you off the edge of the level. Sonic Generations‘ modern Sonic parts have not fixed this issue, though somewhere along the way a targetting reticule got added that at least shows you where the game is going to bounce you to before you bounce (unless you’re stuck in the mashing mindset and press anyway (like me)). Go forwards. Ask no questions. Trust the game. As if the flaky attacks aren’t bad enough, modern Sonic still has issues with even going in the right direction. Direction is relative to the camera — fair enough, it’s been that way since the dawn of first-person games. Unfortunately, Sega still haven’t given up and tied the camera to the keys or the mouse –it’s unpredictable and spends a lot of the time being just slightly off true so you walk over that thin ledge and die when you should be going straight. 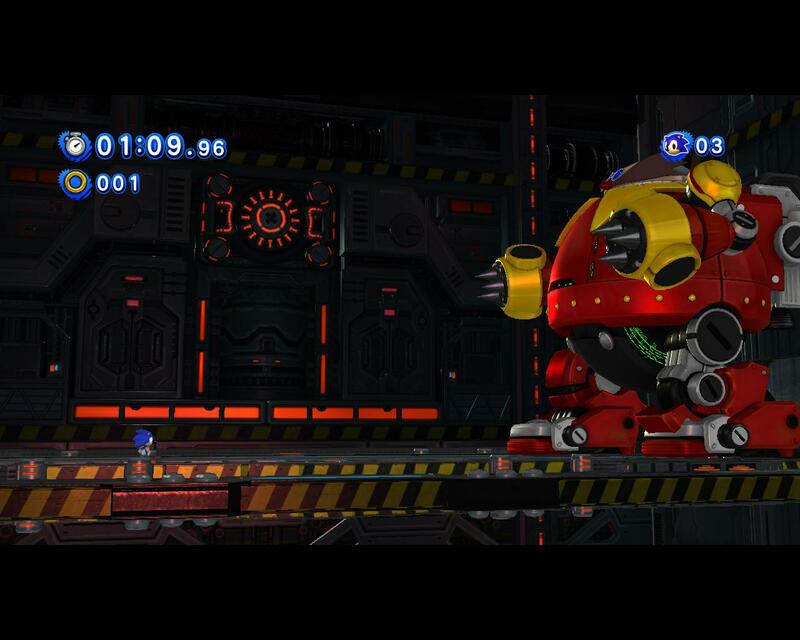 Sonic Generations warns the player that the modern Sonic stages are “more difficult”. And it’s right, they are more difficult — but they’re difficult not because of any real challenge; rather, they are more difficult because the control scheme and interaction paradigms are shot to pieces. I know I harp on about how bad Sonic Adventure DX is, but bloody hell I'd totally sell out for an HD remake. While modern Sonic is still broken he is, to be fair, less broken than he was in Sonic Adventure and Sonic Heroes. While the plot is off the rails it makes up for it with fun jibes at the state of the franchise. And while classic Sonic might be subject to some slightly wonky physics and an annoying tendancy to be facing the wrong direction, he’s still got plenty of sparkle. It is, as with all the older Sonic games I’ve experienced (bar S3&K), an amusing and enjoyable romp that is capable of many hours of entertainment (and then some, if you can be bothered grinding fast level times). Unfortunately, the game cannot be anywhere near great, for the simple fact that it is missing Big the Cat. 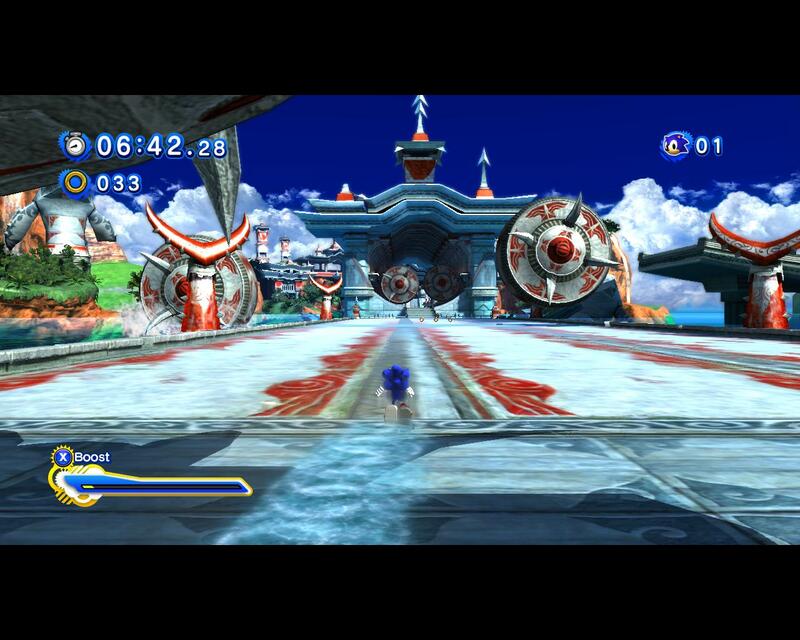 This entry was posted in Gaming and tagged Generations, sonic by Rao Dao Zao. Bookmark the permalink.